Alongside intense efforts to exploit T-cells as immunotherapies for cancer (e.g. checkpoint inhibitors, CAR-T, T-cell metabolism), researchers are increasingly considering other immune cell types for novel targets. One example is the enhancement of macrophage function via inhibitors of CD47 “don’t-eat-me” signalling proteins, enabling tumour cells to evade clearance by neighbouring phagocytes (Kim et al, 2012, Leukemia 26, 2538–2545). To identify new CD47 and phagocyte modulators, novel, direct and validated assays with throughput commensurate to drug discovery are required. -Illustrate how real-time live-cell analysis using pH-sensitive fluorescent probe-labelled target cells can be used to visualize and quantify phagocytosis. -Share data on the pro-phagocytic effects of anti-CD47 antibodies. 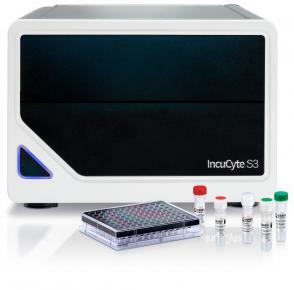 -Demonstrate how other live-cell phenotypic assays (e.g. apoptosis, proliferation) are used to validate mechanisms of action.